New York : Knopf, 2004. The former president looks back on his life and career, discussing his youth and education, his early public service, his years as governor of Arkansas, and his accomplishments during two terms in the White House. There are at least two good reasons to read Bill Clinton's imaginatively titled new memoir, "My Life." For one thing, you're probably in it somewhere. Everybody else is, from Hank Aaron to Gennady Zyuganov to the guy designing dioramas for Clinton's presidential library. Another reason to read "My Life" is that it's a genuinely good and useful book. Mr. Clinton's book is a double flop: Either stake your claim to join the guys on Mount Rushmore or embrace your destiny as a guy who rushes to mount more. The president does neither and winds up with a book that reads like the world's biggest Rolodex punctuated by self-doubt. The book, which weighs in at more than 950 pages, is sloppy, self-indulgent and often eye-crossingly dull -- the sound of one man prattling away, not for the reader, but for himself and some distant recording angel of history. Like its author, Bill Clinton's autobiography My Life is a big, sprawling jumble. Parts of it, as a waspish television commentator observed, read like a press-cutting book, or one of those school magazines in which everyone in the class has to be mentioned. Political memoirs are notorious for being ponderous exercises in self-gratification. It's hard to find a book that isn't like this - Bill's book is guilty of it - but far less than many others have been. On the contrary - it is a piercing and interesting book about the nature of the presidency. It has become more interesting with the benefit of hindsight. Having a friendly debate with Newt Gingrich? Trying to pass health care reform? Preventing the stagnation of the economy? All of these issues are too relevant to the modern discourse. The political wranglings then have only become worse now, and many can rightfully yearn for the peaceful days of the 1990s. I am impressed by his strong memory, attention to detail, his descriptions of events of every nature, his dealings with all characters. Any president has to do some superhuman effort in order to even get elected. Good read from a sorely missed and literate president. I will never claim to be a fan of Bill Clinton and his politics but I do have to say that this biography was well written and kept me reading. The stories related to the international affairs alone were worth reading this book. There are many aspects of the presidency (of either party) that the public simply does not see or do not pay close attention too...Clinton lays many of these things out in fascinating stories. There are aspects of the political policy (in my opinion) that he exaggerated his support. 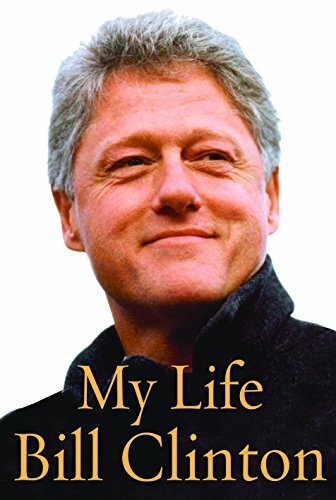 'My Life' is a long and detailed autobiography of William Jefferson Clinton, the forty-second president of the United States of America. Though this book is very long, approximately one thousand pages, it was entertaining enough to read the whole thing. It is obvious that he kept a detailed diary his whole life. Pres. Clinton's book is not the normal biography. It is written in chronological order starting with his boyhood. Though as you read it you will find yourself jumping all over time. He does this whenever he feels he has to defend his actions. And I felt the whole book is about trying to defend his legacy and set the record straight. The book seems very self-serving and he seems more concerned about what we think of him, instead of just writing what transpired. Though I did find his book very easy to read. I did feel as if he I was sitting on a covered front porch with a class of ice tea and listening as Pres. Clinton spins an interesting tale. I had no problem reading the entire book and did find it enjoyable despite his agenda. He does share some of his shortcomings and how he overcame them. This is also a story of a boy making good in America. He comes from rural state and used every opportunity America offers each and every one of us. And that message is worth sharing. An interesting, and surprisingly straightforward, memoir. A long, 900 pages long, but full of information and good stories. If you are a Clinton fan, read it. for example) I found my eyes crossing and had to lay it down for a while. private details of his (and many others as well) life were interesting. This is an interesting review of his life and his personal struggles. I particularly like the personal stories of his political battles while he was President and the inside stories during that time. It is an eye opener of how and why things happen the way they do in Washington, D.C.
A very slow read... not my kind of book. It could have been done with more passion and love. I started reading this and got up until he got a scholarship to college. I want to continue reading it but I'm really not in the mood for a biography right now. Despite being heavily edited from what is a very substantial book, the abridged audio version of My Life manages to cover the major features of Bill Clinton's life, in a time span of 6.5 hrs of tape. What's more, it is read by the author, Pres. Clinton himself. The latter fact is but one of the features that makes this audio book unprecedented. The other is the level of detail that characterizes this revealing and deeply personal memoir. The audio book begins with his childhood in Arkansas; covers his years of schooling and difficult home life; his education at George Wasington University and then Oxford as a Rhodes Scholar; his struggles over the military service issue; his years in law school and his early relationship with Hillary; his move back to Arkansas and marriage; his entry into politics, culminating in the governoship; his successful run for national office; and the eight years of his presidency. This is very long but it gives the reader a great deal of insight into a great American President. If you are a Clinton fan, you definitely should read this. Really comprehensive book. About a billion pages long. Who's the little boy who wrote this book? Oh...the former president of the USA. Bill Clinton is impossible not to like. He seems genuinely honored by the support of others and he is always finding ways to be of service. The book is long, but few can tell a story the way Bill can so I finished it and enjoyed it. -Grew in a partly quite unstable family environment. -Vietnam story important to him. Probably even more so because of criticism faced later as a draft dodger. -the nasty tone of Newt Gingrichs’s Republican party is striking, but maybe above all its certainty. A lengthy quote from Clinton: “Even though I was intrigued by Gingrich and impressed by his political skills, I didn’t think much of his claim that his politics represented America’s best values. I had been raised not to look down on anyone and not to blame others for my own problems or shortcomings. That’s exactly what the “New Right” message did. But it had enormous political appeal because it offered both psychological certainty and escape from responsibility: “they” were always right, “we” were always wrong; “we” were responsible for all the problems, even though “they” had controlled the presidency for all but six of the last twenty-six years. All of us are vulnerable to arguments that let us off the hook, and in the 1994 election, in an America where hardworking middle-class families felt economic anxiety and were upset by the pervasiveness of crime, drugs, and family dysfunction, there was an audience for the Gingrich message, especially when we didn’t offer a competing one. the Union, the South was wrong. This many seem to have retained.